Keeping on growing with the notion of "concept school" to Turkey, Doğa Schools is meeting with the students in Çanakkale in 2015 – 2016 School Year with quality of education and distinctive educational models. Çanakkale Doğa Campus offers the opportunity of learning in a happy and fun environment to the students using all means of technology with rich educational materials. Located in a closed area of 9.500 m2, Çanakkale Doğa Campus contains dreams workshop, ecology, drama, chess, arts and music classes as well as indoor sports hall, library, canteen, Doğa Store, administrative offices, cafeteria and a conference hall. 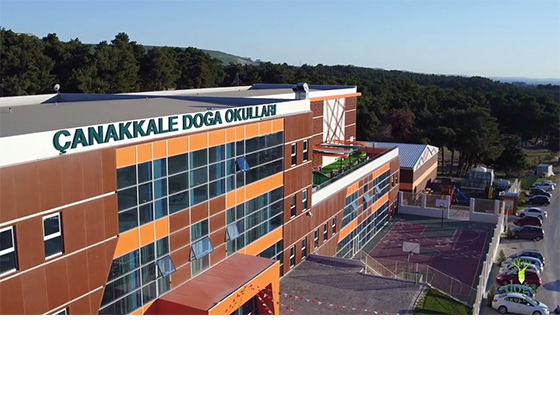 Çanakkale Doğa Campus contains 35 classes equipped with fiber Internet, philosophy of interactive education, android infrastructure, info screens in front of classes and Vestel smart boards for 4+, 5+ (kindergarten), 1st, 2nd, 3rd, 4th (primary school), 5th, 6th, 7th, 8th (secondary school), 9th and 10th (high school) grades initially.